– I really see a clear difference. Wrinkles are improved and my face more vibrant. – After a couple of months I noticed that something had happened. Firstly with my nails, then my hair, then my skin and finally with my joint stiffness. This convinced me that Marine Matrix® really has a positive effect – at least for me. – My body got a real push in the right direction. 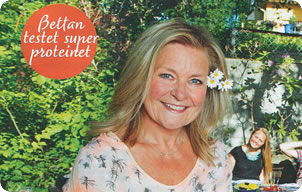 Annette had very prominent stretch marks and cellulites. She is also a sun-worshiper, which eventually had taken its toll on her skin in the form of wrinkles. 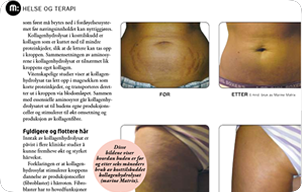 After using Marine Matrix®, her battered skin became firmer over time and the stretch marks on her stomach became nearly invisible. – I sometimes wonder how a blemished body like mine can recover so rapidly. 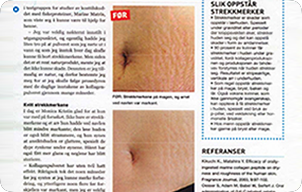 – In my experience my stretch marks have improved by 80%. – If you ask my how satisfied I am from a scale from 1 to 10, my answer is 8. I still have some stretch marks on my stomach, but my skin has become so much firmer that I no longer worry about it. The stretch marks I had on my upper thighs have practically disappeared. 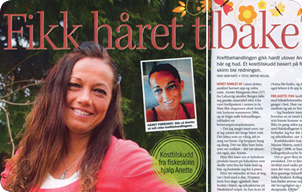 When Marine Matrix® helped me, it may also help other women struggling with the same issues.